Garden vervain (Verbena x hybrida): growing, planting, caring. This description is for ornemental species of verbenas - mostly hybrids. 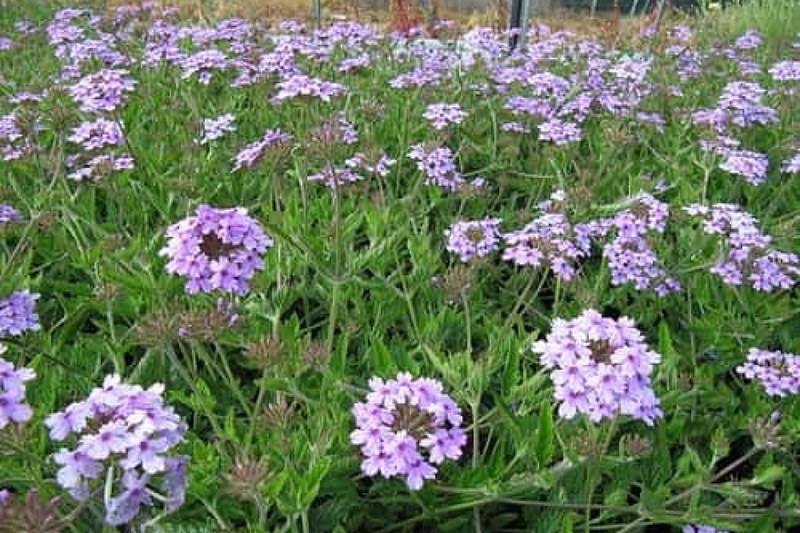 Verbena is a genus in the family Verbenaceae, with about 250 species of annual and perennial herbaceous or semi-woody flowering plants, the majority of which are native to the Americas and Asia. They are herbaceous plants, growing up to a metre high with an upright habit, with usually opposite, simple, and in many species hairy leaves and small flowers, with five petals in shades of blue, white, pink, or purple, especially in cultivars. Some species, hybrids and cultivars of verbena are used as ornamental plants. They are drought-resistant, tolerating full to partial sun, and enjoy well-drained, average soils. Herbaceous plant with quadrangular stem, twigs and leaves most often opposed. Short chalice in tube with four or five teeth, breaking at maturity along the lines of the sepals. Corolla long cylindrical tube with five lobes more or less equal. Four stamens inserted on the corolla tube. Slightly bifid style. Not to be confused with lemongrass verbena, which gives off a powerful smell! Outside: You can sow in open soil in May after the frosts - as for sowing under cover, keep the seeds cool a few days before sowing! Inside: Attention, this sowing is deemed difficult! Sow the seeds in March-April at 18 to 20 ° C. Cover it with a shallow layer of fine earth. The germination of the seeds is delicate enough to succeed: it is advisable to store the seeds for a fortnight in the cold (frost free), in the refrigerator before sowing. Repot 3-4 weeks after sowing - when the first 2 or 3 true leaves appear - in individual buckets or pots. You will have to keep them indoors until the climate allows you to plant them in the garden. Transplant your garden vervain in the ground one month after repotting, outside freezing periods. Space the plants about 25 cm, so that each can enjoy a good sunshine and develop properly. Plant garden vervain in the spring, outside freezing periods. Space the plants about 25 cm, so that everyone can enjoy a good sunshine and develop properly. Verbena is quite greedy in water! It will be able to support dry periods but its flowering will suffer from it! Remember to keep the soil moist during emergence, and do not hesitate to water in hot weather. In a pot, tray and suspension, water as soon as the soil is dry. You can maintain the moisture with a mulching, to avoid the need of frequent waterings: grass clippings are a good material! In late summer, you can add fertilizer to revive flowering and colors of your plant. In pot or planter, add a fertilizer for flowering plant once a week during the entire flowering. You can multiply your garden vervain by stem cuttings in late summer - very easy to make - that you will keep frost free during the winter for a set up next spring. Vigilant deadheading will prolong the blooming period ! Verbena is often frosty: shelter it if your variety is in this case.